Daniel Deng Abot was one of Southern Sudan’s ‘Lost Boys’ – one of around 20,000 boys displaced or orphaned during Sudan’s civil war. After spending 15 years in refugee camps in Ethiopia and Kenya, often in miserable conditions, he and his young family were finally able to resettle in Australia. They were looking forward to a quieter and more settled life – yet Daniel, by then an Anglican priest, soon developed a strong sense that God was calling him to return to newly independent South Sudan. Now an unpaid bishop, Daniel often works in highly dangerous circumstances. 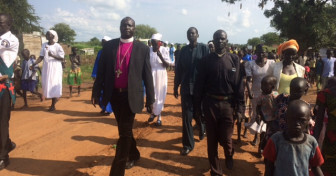 Both he and his wife admit that the price has been too high; yet he remains convinced that God has called him to bring peace to his people, both in South Sudan and Northern Uganda, where many live in refugee settlements.